Description NU7026 is a potent inhibitor of DNA-PK with an IC50 value of 0.23 μM. DNA-PK activity was measured at 30°C, in a final volume of 40 μl, in buffer containing 25 mm HEPES (pH 7.4), 12.5 mm MgCl2, 50 mm KCl, 1 mm DTT, 10% v/v Glycerol, 0.1% w/v NP-40, and 1 mg of the substrate GST-p53N66 in polypropylene 96-well plates. Varying concentrations of inhibitor were added. After 10 min of incubation, ATP was added to give a final concentration of 50 μm, along with a 30-mer double-stranded DNA oligonucleotide to initiate the reaction. After 1 h with shaking, 150 μl of PBS were added to the reaction, and 5 μl were then transferred to a 96-well opaque white plate containing 45 μl of PBS per well, where the GSTp53N66 substrate was allowed to bind to the wells for 1 h. To detect the phosphorylation event on the serine 15 residue of p53 elicited by DNA-PK, a p53 phosphoserine-15 antibody was used in a basic ELISA procedure. The solubility of this compound in DMSO is <2.81mg/mL. General tips for obtaining a higher concentration: Please warm the tube at 37℃ for 10 minutes and/or shake it in the ultrasonic bath for a while. Stock solution can be stored below -20℃ for several months. NU7026 potentiated ionizing radiation cytotoxicity in exponentially growing DNA-PK proficient cells, which can act as a potent radiosensitizer and shows potential as tools for anticancer therapeutic intervention. four times per day at 100 mg/kg, i.p. NU7026 shows a significant radiosensitisation effect in BALB/c mice. 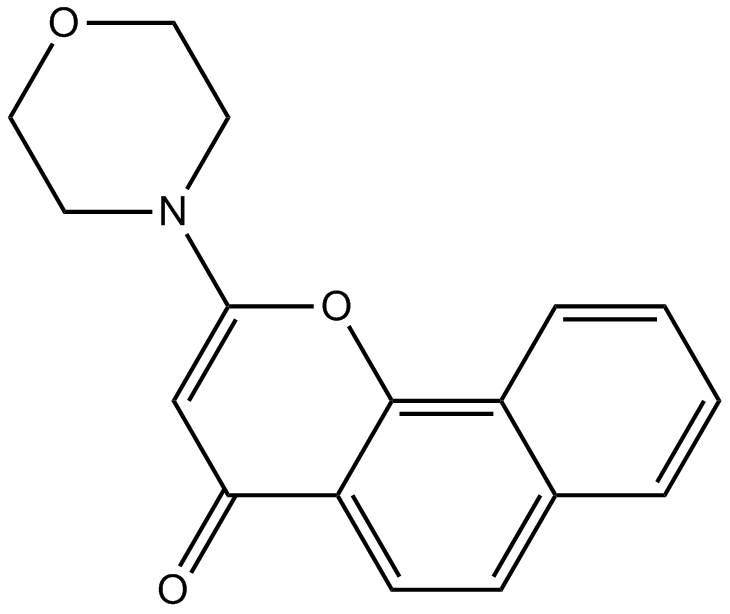 NU 7026 is a selective inhibitor of DNA-PK with IC50 value of 0.23 μM . DNA-dependent protein kinase (DNA-PK) is a nuclear serine/threonine protein kinase and involves in a variety of cellular processes, like, DNA double-strand break (DSB) repair, V(D)J recombination apparatus, chromatin structure and telomere maintenance. It has been shown that increased DNA-PK expression resulted in tumor cells resistance to radio- or chemo- therapy . NU 7026 is a potent DNA-PK inhibitor and often is used combined with PARP-1 inhibitor AG14361 to sensitize tumor cells to radio- or chemo-therapy. When tested with primary PARP-1-/- and cells PARP-1+/+ cells, NU 7026 treatment (<50 μM) sensitized cells to IR-induced cytotoxicity and reduced clonogenic survival by inhibiting DNA-PK . In N87 gastric cancer cells, administration NU 7026 combined with radiation increased DNA double-srand break, cell apoptosis and reduced cell survival through inhibiting DNA-PK . When tested with CH1 human ovarian cancer cells, administration of NU 7026 combined with radiation reduced cell survival rate and clonogenic ability . In female BALB/c mice model with CH1 cells subcutaneous xenograft, administration of NU 7026 orally or intraperitoneally sensitized mice to the radiotherapy with the dose of 100 mg/kg . It has also been reported that NU 7026 is a potent inhibitor of PI-3K, ATM and ATR with IC50 value of 13 μM, >100μM and >100μM, respectively .